The Great Living Chola Temples are three granite temples dedicated to Shiva, that show the progressive development of Chola architecture and art. They illustrate the Chola civilization between the 10th and 13th centuries, which succeeded the Pallavan dynasty (that was responsible for Mahabalipuram) in South India. Brihadisvara Temple in Thanjavur: the earliest and most representative monument. Built 1003-1010, during the reign of king Rajaraja, the founder of the Chola Empire which stretched out over South India and the neighbouring islands. Their layout is different from other South Indian temples, as the Vimana (sanctuary) is the highest point of the complex, not the Gopuram (gates). The tall Vimanas with many tiers as the core feature of the temples and the elaborate sculpted decoration represent the divinities and mythological figures related to the Tamil beliefs. In all three temples traditional religious rituals continue to be performed there by the general public. The city of Thanjavur has over 200,000 inhabitants, but its center feels much smaller and can easily be explored on foot. Signs guide you to the “Big Temple”, as they call it here. Maybe even the Tamils find “Brihadisvara Temple” too cumbersome, although they manage pretty well with their elaborate place names made up of dozens of syllables. I visited on a late afternoon. There was a steady flow of worshippers and daytrippers going into the temple complex. There’s no entrance fee, or limitations to non-Hindus. Only take your shoes off. The entrance gate here is not the prettiest construction of the complex, but did already hold my gaze for a while. The decorations here clearly have a greater quality than those at Mahabalipuram, and it is easy to see how the sculptures here have influenced Angkor for example. After the second gate, awaits the large inner courtyard. It’s a vast open space. In the center stands a large black Nandi statue, covered under a pavilion (under construction at the moment). To the sides are smaller temples. The whole area has a festive air: there’s a temple elephant doing tricks, groups of friends are sitting on the grass and taking photos. The monument at the end of the courtyard is the Temple’s masterpiece: the Vimana, an unbelievably high pyramidical tower, fully covered in sculptures. You really have to sit down to take it all in, it’s exuberant. There are so many little details to admire, and the state of conservation looked very good to me. After I enjoyed all there is to see on the outside of the buildings, I put my camera away and went inside. Photographing isn’t allowed there. The Vimana contains many dark grey columns and some statues. Although the WHS is marketed as “Living” temples, I did not find the religious atmosphere as special as in Chidambaram for example (or maybe I had already got used to the sight of worshippers in their differently coloured loincloths). I did not visit the other 2 temples that were added to the WHS later on. They are located 80kms or so away, and as they do not appear to be very different from the one in Thanjavur I decided not to go there. Three of the chola temples are part of this WHS. Tanjore and Gangai Konda cholapuram are famous for their scale and grandeur. Darasuram is famous for its carvings. Hope Tiribuvanam temple too gets added in this list. That will complete the chola architecture timeline. I have visited all these four sites multiple times. Temple complex in Thanjavur is located in the city centre, not so far from the train station. There are signs leading to the temple, which can be easily reached on foot in less than half an hour (the main tower is visible from quite a big distance so it is easy to find the right direction). If you are short in time and travel by train, it may be enough to designate 3 to 4 hours for the whole stay in Thanjavur. I was surprised at the entrance, as this is one of few places in Southern India where the entrance fee is not imposed. You should only pay a small fee for shoe deposit (in most of Hindu temples shoes should be removed). I suggest visiting the temple in the morning, noon hours can be too hot. And in the morning the place is less crowded. The whole complex comprises of the Big Temple, several smaller ones and the "gallery" surrounding the whole place. In front of the main temple there is a big statue of Nandi, Shiva sacred bull. The place is very well designed so it is a real pleasure to sit in the shadow and admire the beauty of the temples. All temples are full of sculptures, although, as usual in Indian temples, they are not so impressive inside. There were religious ceremonies in the Big Temple and it was even allowed for non-Hindu to participate and take blessing (for a small donation). Do not omit nice and well preserved (although partially requiring renovation) frescoes in the gallery. After visiting the temples in Thanjavur, I took the night train to Madurai, to admire another beautiful temple, devoted to Meenakshi. I have been to Brihadeeshwara Temple once. Only in India one can witness the marvel of MUSIC COMING OUT OF CARVED STONES that too SAPTHA SWARAS. This clearly shows what stones are made of. They say the stones have life and it really is as depicted in the carved musical instruments held by stone musicians carved out of same stones. It is believed a complete Raga Composition was possible to be played in the same MRIDANGAM. Lord Shiva Bless me. Every person who sees this structure will be awe-struck. This inspired similar structures by Kings in South East Asian countries which were conquered by Cholas and handed over to the local people. I think the scripts are lying somewhere around the complexes which must be safely recovered and used for improving the lives of mankind. being a tamilian i am feeling very very proud after seeing such a marvelous temple. after seeing that magnificent temple i wonder is there any temple in the universe which can be compared to peria koil. i have seen almost all big temples in tamilnadu and in india but i was shaken by the beauty of this temple,till now i am wondering its building techniques. I have been to the Tanjore Temple just once, but still I couldn't forget its magnificient structure. I wish to visit again. Its main kopuram (tower) is the master piece. Please don't miss this temple if you visit Tanjore or nearby. Raja Raja Chola was a great man and a great king. If you know to read Tamil, do not miss reading Ponniyin Selvan, an epic (i dont think I can call it a Novel) written by Kalki Krishnamurthy in 1950. It beutifully gives an account of the lifestyle 1000 years ago. You will enjoy Tamil nadu and these temples completely when you read this novel. Every time I visit these temples, I pray to God, that by no means these structures must be damaged and it must continue to be a proof of ancient India. The great Chola temples are the symbol of our Indian ancient architecture.The spiritual feeling one can realise inside the temples cannot be put in words ..They are the living examples for our ancient architecture which will live beyond many more generations to tell the holiness of old tamilian life style and culture.These temples are my favourite place in my own country.. I visited the Brihadisvara temple in Thanjavoor while on a boy Scouts Tamil Nadu cycle tour from my home town in Coimbatore in 1980. The peria koil (big temple) was one of our stops and it was an awe struck feeling after a tired day of cycling! The gopuram carvings are magnificent. The massive monolith at the top is testimony to the prowess of the artisans. 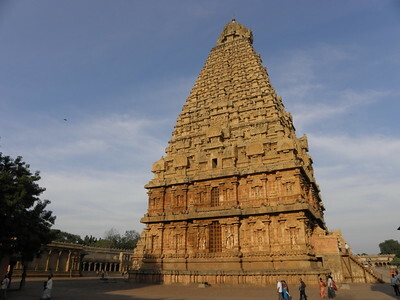 I have visited four of the big Chola temples in Tamil Nadu, India. These are the Big Temple in Tanjore, Gangaikondacholapuram, Darasuram and Chidambaram. All four are grand monuments. The first three are on the UNESCO list. While I have heard my parents crib about the sorry state of the big temple a few years back, recent renovation efforts (at the fitsr three temples) have highlighted their grandeur while conferring upon them an enchanting ambience. Besides the massive size of these monuments, the exquisite sculptures add to the grandeur. these are the best temples,along with khajuraho temples, i have ever seen in my life.i have visited these temples thrice in my life.i am in awe of these magnificent structures ever since i visited these places. The bragadeeshware temple (popularly known as big temple)is one of the architectural marvel of indian sculpture. The people visiting the temple is also blessed by 'Karuvoor Thevar' (A Saint and guru of the king 'Raja Raja chola') who is in samadi inside the temple. The god bestows all benefits to those having dharshan there. I last visited the temple on 25th Dec 2004, the day before tsunami that hit Tamilnadu. The grandeur of the Temple shows us the artistic value of the people who constructed it. We still cannot surpass the scale of the construction even today with all our modern technology. This exhibits the excellence of the KINGS who ruled our country especially TAMILNADU. Every time, I enter the temple, I feel spiritually elevated. It is a great experience to be inside the sanctum sanctorum of this great temple. 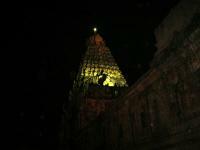 Raja Raja chola, built this temple so big to bring the idea that "God is great" in the minds of every one. He is so great that the world sings his praise even after 1000 years. Last time, when I visited, there was a power cut when I was infront of Brahadesswara. For a moment, I could make dharshan as though, I was living 1000 years ago, as I saw the Lord in the lights of the lamps. 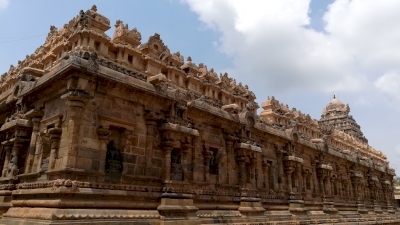 Darasuram temple and Brahadeeswarar tempe reveal the greatness of the Indian scuptures. This temple will bring peace in your mind. You will be blessed by Lord SHIVA and can you can have a happy life. The Temple Town stands as Testimony to the Dravidian type of Architecture .One amazing thing is that ,one has to Imagine,that India particularly Tamilnadu was not Modernised and the struggle taken by THE KINGS to build it and more over one can notice that the shadow of the Gopuram (the Bulb shaped structure at the apex )does not touch the bare ground nearby but the shadow falls on to the Temple complex. The brihadisvara temple is magnificent. I was there every evening Puja,for darshan Of the giant Lingam,for three days,and on millenium eve. To have been at the foot of the biggest lingam in India, in one of the most spectacular stone temples in the world was a very special way to turn a millenium. I hope to return this lifetime. if you are near or in tanjore dont miss it! From "Brihadisvara Temple, Thanjavur" to "Great Living Chola Temples"
Role of Women: Brihadishwara Temple has inscriptions containing details of the 400 Devadasi dancers kept by King Rajendra I at the temple. See link (and Wiki) for details of the Devadasi system/culture.